Heh Heh, did you see what I did there? Granny’s spectacles or Granny blanket’s specifications? So after weighing all of my Stylecraft Special Aran, I came to the conclusion that I used just over 16 balls of it, in 30 colours, approximating to 3150 metres. And spent at least 50 hours making it. It wasn’t sunny this morning but I draped the blanket on my deck and did manage to get some better photos which are more in focus and show the colours better. I also have photos of the wooden box stuffed with yarn that I worked from all these months. At the top of this post is the box stuffed full at the very beginning and in fact I also had duplicates of some of the colours in a separate bag. Plenty there for more projects, anyway. A home day, in which I tidied around, did some yoga, went for a walk, and watched Summer in February on Netflix while working on Grandma’s Knickknacks. I had to break to prepare dinner (scalloped potatoes, nut roast, broccoli, salad) but I have only half a round of navy blue to go and I will be FINISHED (imagine Kermit the frog waving his little arms around and saying Yaaaaaaaay)! I am so excited to be this close to finishing. I have just had the most relaxing and rejuvenating week. The blog was neglected, not because I didn’t take my iPad with me, but because I was out of town at a health spa right here in the province of British Columbia. Silver Hills guest house has been operating as a health spa for over 30 years. It’s set in rural countryside surrounded by hiking trails and unpaved logging roads, with its own garden which produces much of what is later served in the kitchen. The food is all vegan, except for the honey, abundant, and beautifully presented at three set times per day. Snacking between meals is discouraged (and really unnecessary)! There is very little caffeine available, only decaf coffee for the diehards, and a little cocoa powder in the zucchini muffins. The schedule incorporates two walks per day, one after breakfast and one after lunch. Health lectures each night explain the importance of correct nutrition, water consumption, deep breathing, exercise etc. It’s run by Seventh Day Adventists and therefore there is a spiritual component, saying grace before meals, and a short gathering each morning, which you can embrace or not as you wish. The morning gatherings did include a lot of laughter as well as inspirational readings. The spa is beautiful, with a steam room, infrared saunas, hot tub, and treatment rooms where you can enjoy salt scrubs, massages with or without hot stones, detox wraps, reflexology etc. What a treat. When I initially heard about Silver Hills I looked up their website and thought it sounded expensive but now I think otherwise. You get a beautiful room with en suite bathroom, three enormous meals a day, spa services, guided walks, cooking classes and health lectures. And at the end of the week, you leave with the feeling that you are part of a bigger family (the staff eat with the guests). It’s actually a non-profit organisation and the cost is worth every penny. 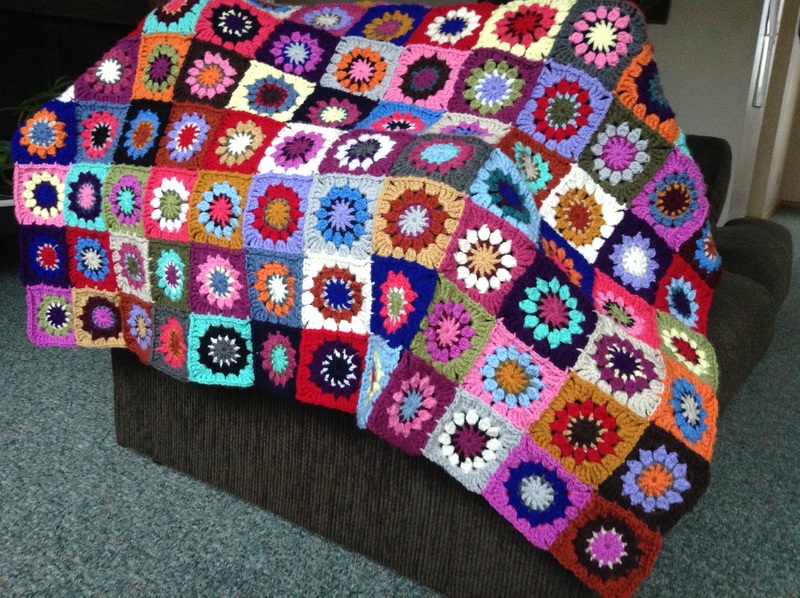 While there, there was some downtime, so I worked a little on my crochet blanket which attracted a lot of attention. So far, 122 squares out of a possible 180 have been added. So 67% unless I decide to do more or fewer. In the photos below, the newest squares are at the top. I hope your week has been awesome too. If ever you feel the need to destress, I strongly recommend a visit to a place like this, even if it’s just for a day. But a week is better! 113 squares so far…62% of my intended total of 180. That’s not to say I’m 62% of the way to finishing, as there may be a border later. Having a nasty cold and calling in sick to work meant I was tucked under my Groovyghan plus this new blanket for a good part of the day, with tissues, cough lozenges, water, tea, Netflix and cellphone to hand. Now it’s 4pm and I have to get some food sorted out for the family. Look! A fancy tiled mosaic of photos. When I went to write a new post tonight, my WordPress window looked different, and when I added these three photos I had the option of different layouts. My Ravelry project page says I’ve had this blanket as a Work in Progress for six months! It has obviously been languishing as I have been giving more attention to other crochet projects (sorry, blankie). The last couple of days have seen four new squares added on, hence the update. 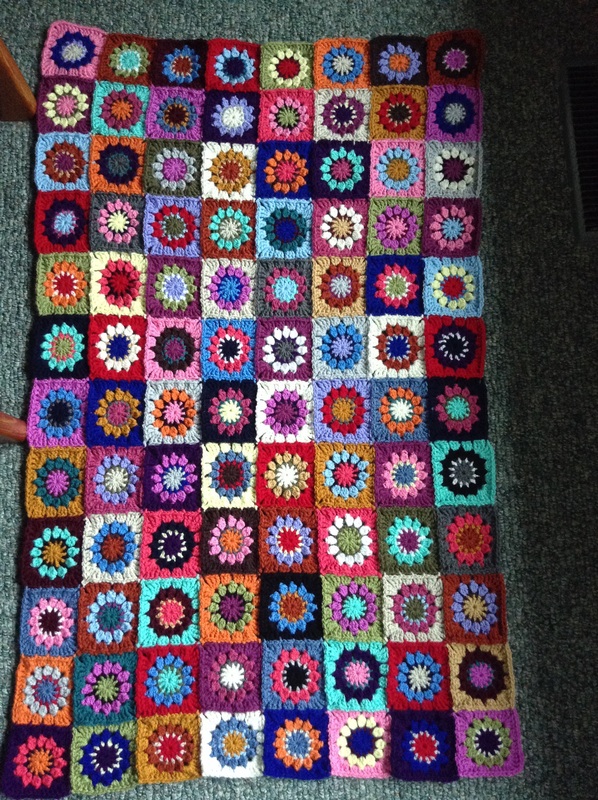 There are now 100 squares and now that a new row has been started I am committed to continuing on. My original plan was to make 180 squares and I should really stick to that. It’s not like I have a deadline to finish it, and now that the wintry weather is here (single digits and wind whistling around the house tonight) it’s keeping me warm as I work on it. I had an 8 hour workday today and I really didn’t feel like making the effort to go out and meet my friend for a swim, but I did, and I’m glad. Feels like I’ve really earned the crochet and couch time tonight. i don’t want to over share, so suffice it to say that Tai Chi Man and I had a rough night’s sleep last night. He caught a tummy bug and was having to stay close to the bathroom on Sunday. Yesterday we thought he was fine but at 3am this morning he was back in there! And so was I! Luckily we have an en suite and a main bathroom upstairs and another full bathroom downstairs, because with the kids not wanting to sleep at night and being in the bathroom last night, and hubby in the en suite, I had to run downstairs. I am grateful that (a) it does not involve vomiting and (b) it’s not painful. So I am still in my pjs with oregano oil on my feet, hydrating with lemon water and self-medicating with Yorkshire tea! I updated my Ravelry project page and was surprised to see that I started this blanket in May. It’s taken nearly four months to get this far, but I have been making other projects here and there to satisfy my finishitis cravings. It’s a wet and cloudy day today and the window thermometer is displaying a chilly 12 Celsius, so being indoors and having a crocheted blanket-in-progress on my lap is perfect. A friend of mine said the other day on Facebook that she had already turned on the heating in her house. I identified her problem as not having any crocheted blankets, so I gave her my bulky pink/chocolate ripple blanket, finished earlier this year.